Parcourez les rues de Vienne à vélo pendant ce tour de vélo de 3 heures. Dirigé par un guide expert, montez à cheval et découvrez les teintes vives de la Hundertwasserhaus et de l'emblématique grande roue du Prater. Vous passerez également devant des sites de premier plan comme le palais de la Hofburg, l’hôtel de ville et l’opéra, vous en apprendrez davantage sur l’histoire de la ville grâce à votre guide. Après trois heures de visites et d’air pur, votre visite se terminera à son point de départ initial. Votre visite à vélo commencera dans le centre de Vienne, où vous rencontrerez votre guide et recevrez un bref aperçu de la sécurité. Ensuite, partez pour la ville en suivant votre guide le long de la Ringstrasse, la célèbre rocade qui met en valeur le cœur de la dynastie des Habsbourg et de nombreuses attractions de la ville. Imprégnez-vous du bon air et de la superbe architecture viennoise en passant devant le projet néo-Renaissance de l'opéra de Vienne, de l'hôtel de ville, du Parlement et du palais de la Hofburg, qui abritait autrefois Marie-Antoinette. Faites une pause pour admirer les teintes vives de la Hundertwasserhaus, un immeuble résidentiel animé conçu par Friedensreich Hundertwasser. Arrêtez-vous sur la place des Héros pour voir le lieu historique où Hitler a prononcé son discours d’Anschluss en 1938. Continuez vers le parc d’attractions Prater, où vous apercevrez la grande roue, l’une des structures les plus emblématiques de la ville. Ensuite, pédalez le long des eaux bleues du Danube avant de revenir à votre point de départ initial. Our guide Horst not sure if I spelled it correctly was fantastic! Great personal insight to the city and events past and present. Even though it was pouring rain we had a great time. The tour was informative and took us all around the city. We did it on our first day in Vienna and it did help us a bit with our bearings. We did this tour as a family of four. The meeting place was easy to find and the tour guide was very informative. My family had a great time visiting some of the most important tourist sites in Vienna. We had sufficient number of stops and got rest for a few minutes. There was a stop for bathroom break and a little shopping too. Overall highly recommended. 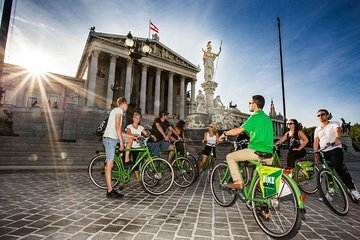 This is the best way to see Vienna. The tour was full of history and kept my 10 year old daughter occupied and happy as she was on a bike. A win win for all. Would definitely do it again. Totally safe as well. This was a good tour with a good guide. It would have been nice if it was fewer people. It was hard for the guide to keep the whole group together on the crowded, busy traffic streets. Excellent. Our guide Horst was great. He knew his way around, gave just the right amount of information. Took us to all the main sites and a few others. Thoroughly recommend. Amazing! This tour was everything we expected and more! Kaspar was our guide and gave us so much history of this beautiful city along the Danube River plus took us to places for great photo opportunities. The tour was longer than the time stated which didn't bother us because of how much we saw and learned. Easy streets to navigate and felt safe the entire time. Saw lots of Vienna the tour was very do-able, even for seniors like us. The guide was careful to make sure all were together. He could have appeared more engaged in the tour perhaps he has done it too often.